Even getting the rebuild started, minor as the task was, last night felt like a huge accomplishment. My whole attitude towards the truck has now changed for the better. What was once a hulk that I had jammed in the corner of the driveway to get to eventually is now something that’s a real proposition with a future. Yeah, it was just two pieces of wood that I unscrewed last night. But I unscrewed them with intent and purpose I didn’t have before. I’ve been reading up on the entire process of the body swap, as well as the components of stripping the interior out. It definitely is a major task, and perhaps slightly more major than I anticipated. But at the end of the day, it’s unscrewing, unbolting, unplugging — and documenting and labelling, the most important parts. 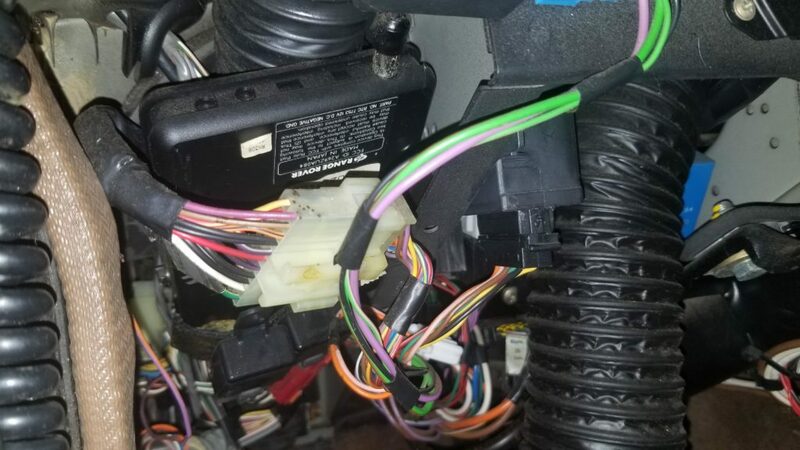 There are so many odd discrepancies in Range Rover Classic wiring harnesses. Between electrics and mechanicals, there were tons of mid-year changes in these trucks. Things got stowed away and spliced in in all sorts of odd places. I had bigger goals tonight, but I got home from work very close to dark, and by the time I ate and changed, it was effectively dark. But the goal of the project is at least one item on the list completed every night, and so tonight’s goal got reduced to just removing the driver’s knee board. 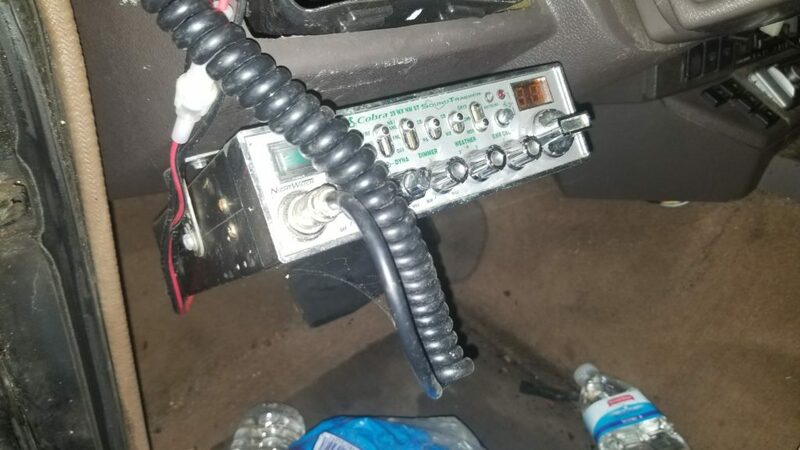 Around 2011, I added a CB radio in the truck — a big, honking, chrome-trimmed Cobra unit I got on eBay. 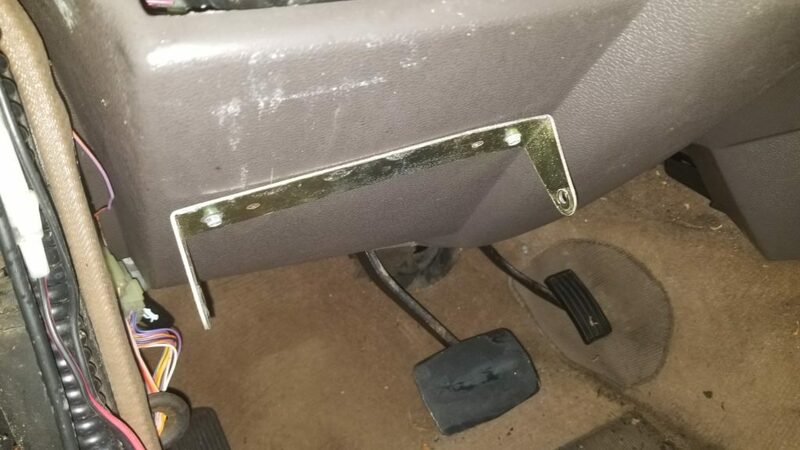 At that point, it was no big deal to just drill into the dash panel to install a bracket to hold it…so I did that. Now, as I undid those self-tapping screws, I thought of how that panel is probably worth a hundred dollars or more without those holes. But no matter in this case, I’m putting it back soon enough in the rebuilt truck. Tossing out Benjamins…I worked my way around, and finally got the kick panel out, with a bit of massaging to get it fully free without breaking the fragile plastic. The whole thing has little acorns living in the foam. With the moisture that’s been hanging out in here, the dirt, and being 25 years old, I’m going to think about how to replace this foam stuff. It’ll be at the mirror end of the project in many months, so it’s not urgent, but this is a bit janky. 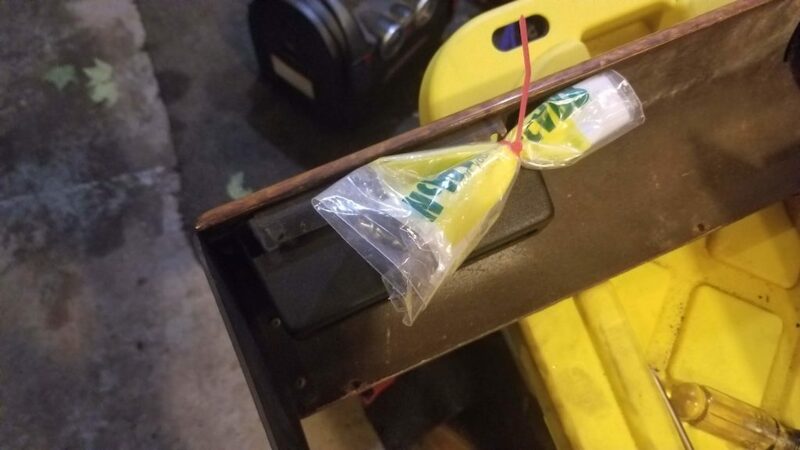 The moisture inside the truck in general isn’t great at all, and I’m going to really have to pay attention to wiring and textiles to prevent issues after reassembly. But that attention to detail is what excites me about this project, honestly. With the truck already laid up for years, my OCD can go wild. And there is a LOT of wiring. 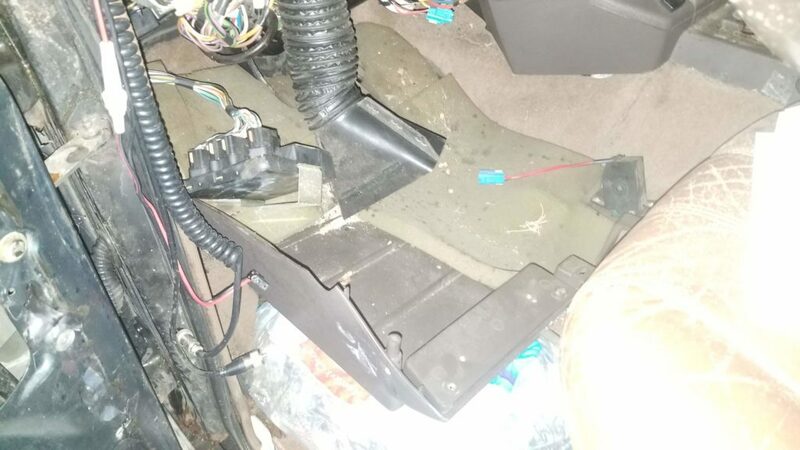 The black box with “RANGE ROVER” on it is the alarm ECU module. I’m not sure it even has a bracket holding it in. They seem to have just jammed it in a corner. If only I had the remote to go with it! Maybe I’ll seek one out as a finishing touch at the end. “Hey, Donnie, think it can go there?” “Sure. To the pub!”The panel is out, another step done. Tomorrow, since I’m working home on a nice sunny day, I’m planning to get a little more progress. But it’s a journey, not a race, as my friend/accountability partner Nathan said, and the goal is to not break anything and enjoy the journey. Because breaking stuff gets expensive now that people actually love these great trucks. Now that I’ve introduced Project ReSpenny, it’s time to begin the accountability blog. This is a large-scale project, and to keep it on pace requires doing a little something every day. The advantage this project has over my Discovery 1 rebuild before the Mother Country Trail trip is that the Range Rover Classic is very clearly not my daily driver. Things can come apart and sit for a bit without worrying about getting to work. Jobs can be done properly and thoroughly with serious attention to detail. The other advantage to this is that I can really pace the entire project around my life. Preparing for the cross-country trip was difficult, as I tried to balance work and an impending to-do list. But this project can go at a more relaxed pace. Since I know that I can get home late from work a lot, often very stressed, I’ve decided that the goal is that I have to do one task — only one task — a night. 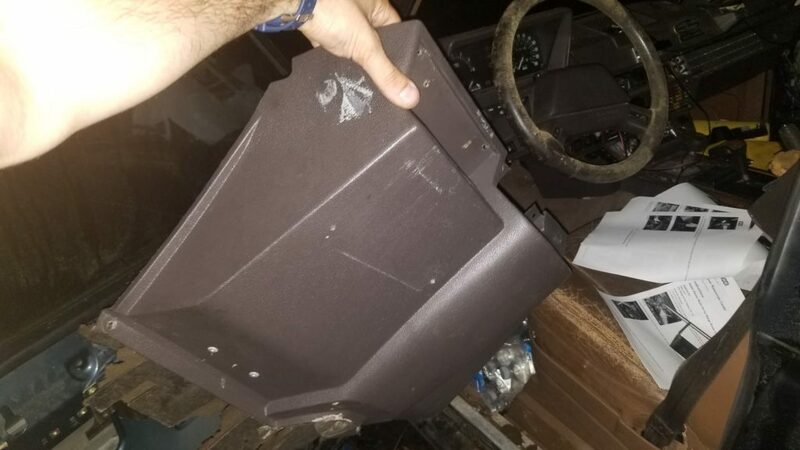 The first step of the project is to disassemble the dashboard assembly. The dashboard on a Range Rover Classic is notoriously delicate. A bunch of hard plastic and wood pieces held together by screws, it’s part of the gloriously primitive nature of the RRC. However, a quarter of a century later, a lot of these hard plastic pieces have a tendency to crack as you try to take them apart. A few cracked tabs and the whole dash will never fit together quite right ever again. The first piece to take off is the wood fascia that holds the air conditioning vents — a glorious slab of “Mediterranean Poplar” veneer, unique to the 1993 Range Rover Classic County LWB. Some things on the truck are not in great shape, but this veneer actually is pretty nice all things considered. It’s held on by 15 screws between two sections, but somehow when I got everything out of there I only had about half as many — and none of them matched. Needless to say, I’ll be replacing hardware as part of the project. The rest of the fascia panel looks decent. 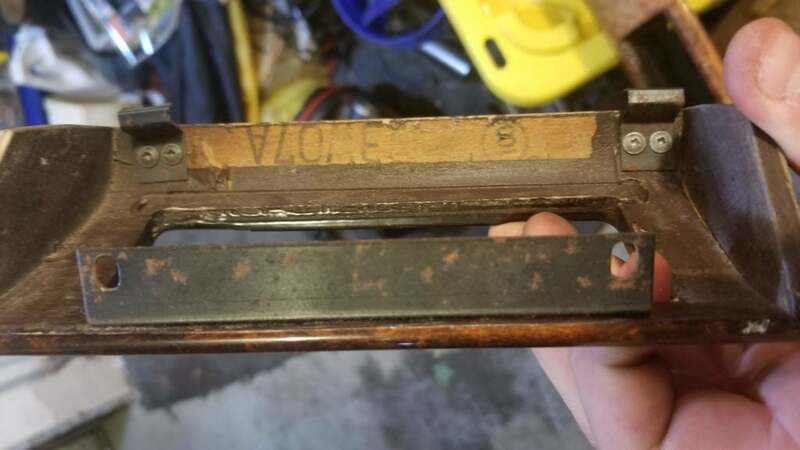 There are brackets that hold it to the plastic, and they do have some surface rust. But I can definitely tidy that a bit and paint them up again to prevent further moisture damage. They’re screwed on to the back of the fascia with little tiny screws, which are probably best left undisturbed. Removing these two panels took about ten minutes, and then about fifteen more to package up the screws, tidy the fascias a bit, and put them in the back of the truck for storage. But sub-half-hour tasks are perfect for this endeavor. They’re the kinds of things I can do even if it was a really long, stressful day at work. Tomorrow’s goal is to take off the dash top — nothing more. The goal is to post here to maintain accountability, in addition to reporting to some fellow Range Rover Classic fan friends on progress. The posts are going to be titled with “Day X,” but those days need not be consecutive. Every time I do just a little bit, it counts as one of the #SpennyDaysandNights that make up this project. Day 1 Result. 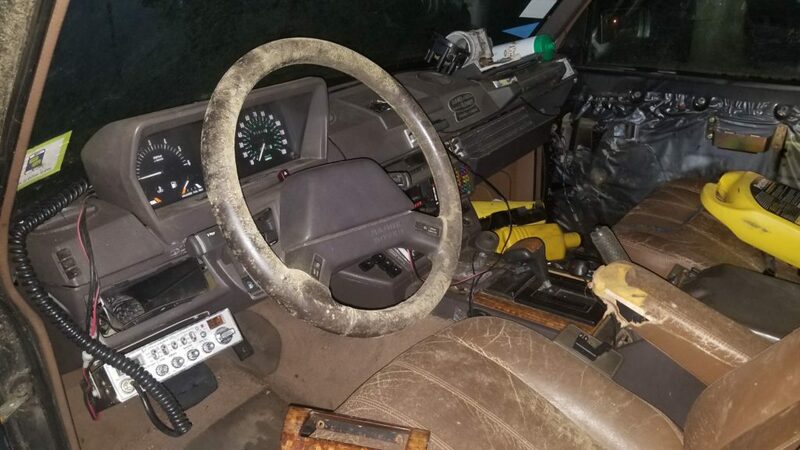 Yes, I know the steering wheel is more than a bit mildew-y…but it’s been flaking in my hands for years, and I’m hoping to put an 80s 4-spoke on there! In February 2007, my parents bought me a 1993 Land Rover Range Rover County LWB. 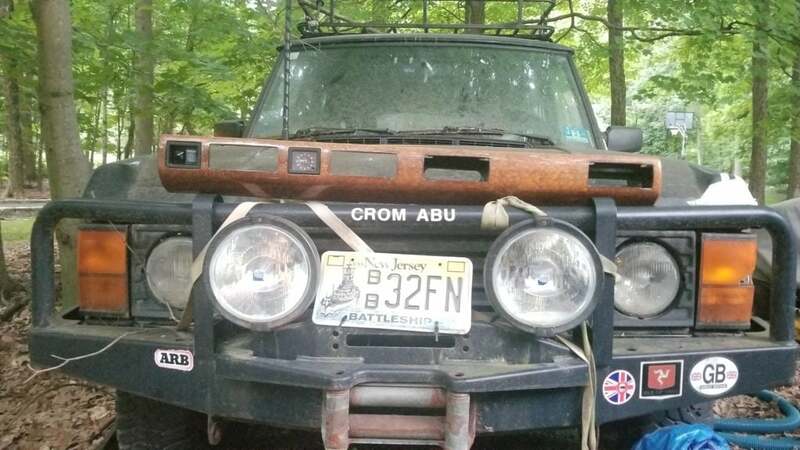 It came from a fellow Land Rover owner in Virginia, it had lived its life between New Jersey and Washington, D.C., and though it needed a little work, it was a solid truck. A fourteen-year-old modern classic, the Rangie got me through high school and college, and was my gateway drug into the Land Rover community. But I didn’t really know what I was doing with these things until a few years hanging around the Land Rover community hands-on. One thing I didn’t get was where and how badly these things can rust. So, in oblivion, I continued driving it around the salty Northeast, as crossmembers and sills and body mounts started to chip away. Finally, in early 2015, I realized that my beloved Range Rover Classic needed a lot of repairs. It was rusting. It needed a brake job. I kept having to replace the exhaust to pass emissions. I’d gone through several pretty bad ignition issues that had led to some tense off-road group trips. The driver’s door was literally falling off. It was time to get a new daily driver, so I got my Discovery 1, a project on its own. I rebuilt it, drove it around the Northeast, did a lot of work, drove it to California, and decided that now I felt pretty good about myself and wanted to deal with the old RRC. At this point, the rust has gotten pretty bad from sitting off to the side of the driveway for several years. The sills are totally soft; the bottom of the A-pillar on the driver’s side having fallen on the ground of its own volition. I have a welder, but it’s clear the only rational solution here is to do a frame-up rebuild with a new body shell from a truck being otherwise scrapped. The chassis is pretty good, and many body sections are surprisingly solid, but what’s bad is very bad and above my beginner’s skill set. Body swaps, however, seem not that difficult, in a relative way. They do it a lot in the United Kingdom, with both Range Rover Classics and Discoverys. It’s even common now with the Discovery Series II here; a poor-quality rear frame section design means a lot of really solid bodies and drivetrains are getting new galvanized chassis underneath them. So…why not my truck? The plan is a Northeast-proof truck. At the least, I will be galvanizing the frame. I’d love to galvanize the new bodyshell, something that some people have, in fact, done. Everything will get rust-prevention coatings. All of the rubber will be new from bushings to belts and hoses. Some parts will be off-road uprated, and as that part of the project comes along, cash permitting it may become a mid-tier off-road beast. The interior will get renovated some. 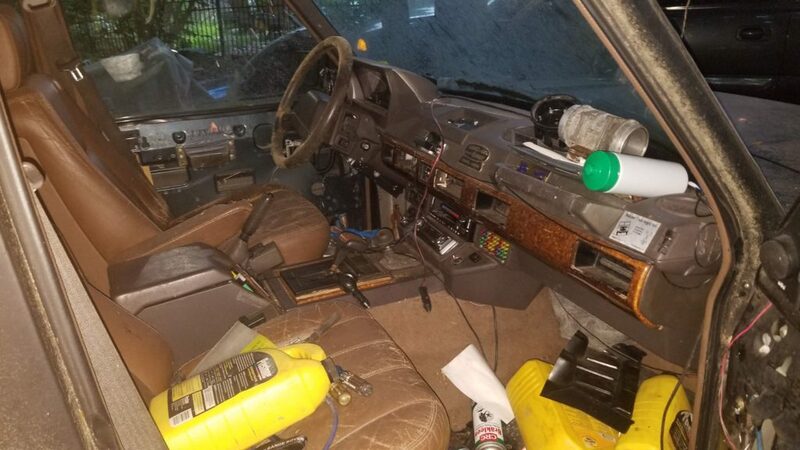 The entire truck will get a ten-foot paint job — the best part about a Range Rover Classic is that the body panels bolt to the inner bodyshell, so while the core of the truck won’t be mine, the outside will be almost all original material, my dents and all. Only thing is, I’ve always hated the Beluga Black, so I’m thinking a change of shade might be in order. This is not a minor task. It’s not an economically intelligent task, perhaps. I could have one of my friends from the Mendo_Recce list in California find me a stunning western Range Rover Classic, truck it home or have another epic roadtrip, and drive it here. But just one winter stored outside, driving on salty highways, will send it down the same path. The only way to have your cake and eat it too is to do something like this — a frame-off no-holds-barred winter defense. When I took this truck off the road in the spring of 2015, this whole project was an optimistic pipe dream. It’s a pathetically sentimental endeavour, for sure; I’ve tried and failed to junk this truck several times now as it’s sat in the driveway stationary. Now, three years later, I’m ready to tackle it and see every challenge that it can bring on. I love nothing more than blazing trails in the Land Rover world, and this is a great chance to go off-piste.